Each marble egg is unique. The photo shows the actual egg you will receive. Marble relieves stress and helps one to become very focussed and clear. It aids concentration, enabling one to accomplish tasks and complete projects. Marble helps bring creative solutions to problems and gives one a new perspective on difficult situations. It aids transformation and can help change or reduce discontentment. It enhances the development of children, alleviates allergies and is said to strengthen the kidneys and spleen. Fossils are the remains of prehistoric animals and plants that have been transformed into stone. They are used by shamans throughout the world to amplify energy and can be placed on the altar to increase the power of any magickal ritual. Fossils are frequently worn or carried to increase one's natural defences and to extend one's life expectancy. In general, fossils are used as protective amulets and can assist in past life recall. 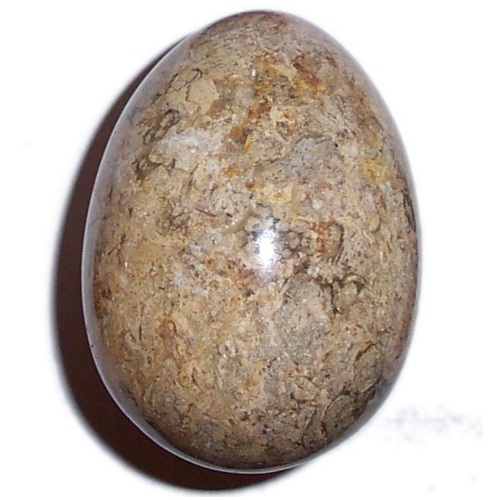 This beautiful Marble Egg will be sent to you charged with beautiful healing Reiki energy.